South Kolkata, your wait for a good fix of coffee is set to get over! 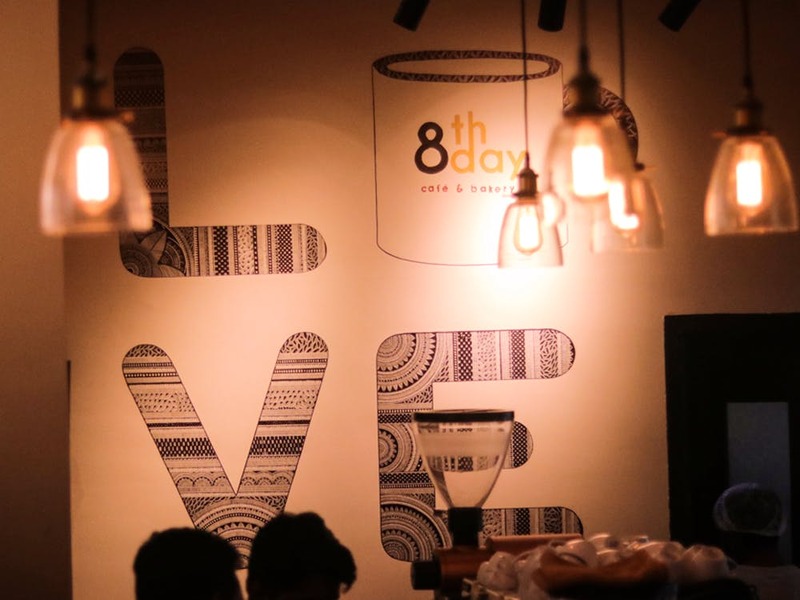 8th Day's new cafe near Purna Das Road is ready to welcome you. We got invited for a dekko yesterday and got the deets. The scene from outside is charming in itself. Take two paces down from Zucca Lounge and Drifter's Cafe, and you'll come across 8th Day's new address with its signature white store front and grey lettering, and a delightful outdoor seating arrangement (perfect for for the fall season that lies ahead!). Pop into the white-brick walled and dark-wood-furniture dotted cafe and the first thing that'll meet your eyes is the sleekly beautiful gold-and-black coffee machine that sits in the corner overlooking the street. It roasts and grinds coffee and promises to woo you with the heavenly aroma. Just like the first cafe, this too has board games, books and merchandise on its shelves. The cosy sofas and the pretty wall doodle gives a plush new feel to it. If you’re a digital nomad, then this place is ideal to spend some good hours working on their free WiFi while sipping on their fantastic new brews (try the tonic cold brew) and stealing a glimpse of nature (Vivekananda Park is nearby) every once-in-a-while through the glass windows. The new place has new nibbles too. Pick the shredded parmesan chicken or the shredded pesto chicken sandwich for a meal, but if you're craving for something sweet then give their new mochaccino cupcakes a try! If you love a good cup of joe, then you should try 8th Day's bag of freshly-ground coffee that they stock in both their cafes. A bag of 250 gm of coffee costs about INR 450. This Eatery's Spiced Pumpkin Dishes Are Keeping Our Fall Mood Lit!